The archives in question, which originate in the Mexican town of Cholula, Puebla State, consist of approximately 200 boxes and span some four decades, from the 1500s to the late nineteenth century. 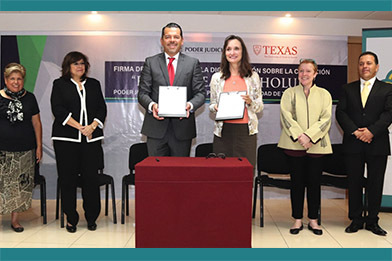 Once digitized, they will be made available to researchers on an open-access platform by the Benson Latin American Collection and the University of Texas Libraries. The materials document, among other things, how Indigenous residents of Cholula navigated colonial judicial structures unique to their special juridical status. The materials will provide a rich trove of information about the colonial period, referred to in Mexico as la época novohispana. Cholula was one of only nine locations to be designated a ciudad de indios (in contrast, there were 21 ciudades de españoles). Ciudades de indios had a different justice system than others. Indigenous people paid their tribute directly to the king instead of to a colonial intermediary; they enjoyed certain privileges, and they maintained a fully functioning Indigenous cabildo, or council, which ruled alongside the Spanish one. "This allowed for a degree of Indigenous autonomy and exercise of special privileges in the new colonial context," explains Professor Kelly McDonough of the UT Austin Department of Spanish and Portuguese. LLILAS Benson might never have known about the collection in question had it not been for McDonough, who identified the collection as a good candidate for digitization. She emphasizes that the digitization of ciudad de indios documents has immense historical significance: "It's the first time we will be able to understand what Indigenous justice meant in place with a very specific juridical designation and relationship with the king of Spain. We believe that the other eight judicial archives from ciudades de indios burned in the Mexican Revolution." "The chronological range of the collection will allow scholars to study how Indigenous practices adapted to Spanish rule, how new practices developed over the course of the early-modern period, and how both Indigenous and Spanish practices further adapted to modern political and legal structures in the nineteenth century," adds LLILAS Benson digital processing archivist David Bliss.